We’ve seen more than 1,000 bats come and go. After heavy work with the bats, we usually just ignore considerable ball marks and ball scuffs. But, every now and again, we want to remove ball marks and clean the bat. How do we clean our bats? Two tricks we show below. 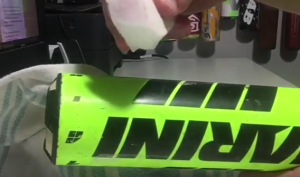 Over the years we have found some tricks and tips to clean your bat. 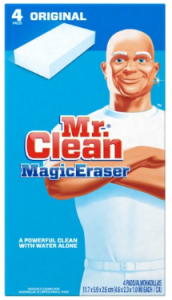 The best trick, far and away, is using the Magic Eraser. Made by Mr. Clean, and relatively inexpensive, the little gadget cleans your bats in no time and is much more effective than soap, water and a number of rags and towels. But, do note, magic eraser is really just a very fine sandpaper. That is, it can, if you do it too hard, remove more than just the ball mark. So, don’t overdo it or you’ll remove the paint/gloss too. Manufacturer suggest you use a mild soap and water. This works too for most marks and, if you don’t want to to spend the few dollars on the magic eraser then it is your next best bet. Manufacturers are comfortable with a mild soap and warm water applied with a softer rag on the bat. This approach is nice enough, no doubt, but usually not strong enough for serious ball marks. A stronger non-metal brush, that you’d use to get grease off a pan in the kitchen, is also useful in some instances but requires serious effort and time. There is some risk of scratching the paint job if you are too aggressive. In practice, however, none of those options work entirely for most serious ball marks. There is really only one trick to cleaning ball marks off a bat. It is the Magic Eraser. There isn’t anything magic about this. Instead, it is made from a foam that resembles a very, very fine sand paper. When wet it works well on high gloss finishes. However, do be aware, over rubbing certain areas might leave microscopic scratches. We rarely rub in the same spot for more than 10 or 15 seconds. The good news is we have yet to come to a spot that needs more than just a few seconds of rubbing. At the risk of this sounding too much like an infomercial, you may find the bat cleaning video we did helpful. To make a long story short, the Magic Eraser is our go to bat cleaning trick. Soap and water doesnot cut it. And for less than $5, it can be used on a few hundred bats before it needs replacement. 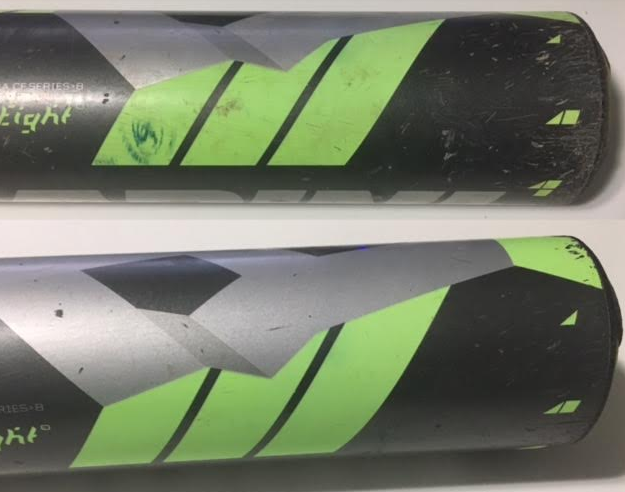 Does a Clean Bat Matter? The short answer is, obviously, no. A clean bat shouldn’t hit a ball any further than a dirty bat. Assuming, of course, we are not talking ‘caked in mud’ dirty. In fact, it could even be argued scuff marks give it personality. But, ask Ichiro Suzuki if bat perfection means anything in the grand scheme of things. One of the better hitters in the game kept his bats in a humidifier and a massive carrying case. Players at the top level of the sport care a significant amount about their bats, and take considerable care of the bats too. Why not, then, take care of our nearly $400 composite bats with a little cleaning once and again? It isn’t a crazy idea.